The ant farm is not working out quite as we had hoped. This is mainly due to the fact that Felix has lost a small but vital part of it: the door. Thus, it is an open-door ant farm. We waited and waited, through the long cold wet month of April, for an ant to appear to populate the ant farm. Felix went out faithfully, every day, to the back garden to check pavement mortar, under benches, beneath stones. But the ants were not for coming out. Not in this chilly wet ant Armageddon. And then the sun came. And lo, Felix found an ant: a lone ant, perhaps an envoy of some kind, sent out to see if the waters had subsided, because you see ants don’t have doves, and any attempt to send a dove out to find land might end in many ants being tragically squashed. So the envoy ant was carefully wooed with a finger, and lovingly borne to the prepared ant farm, the precursor of a great Shrewsday colony, a brave new ant world. Felix dropped it into the farm and then there was an almighty stampede by all adjacent humans to find something with which to block the door. My masterly solution was kitchen paper. We moulded it to fit the doorway: yet, with that ability to beam up, shared with the Star Trek crew, the ant teleported out of there. It was last spotted energising on the other side of the paper and heading for the back door to tell all the other ants what it had seen. Doors do not hold much challenge for an ant. As the envoy proved, when it relayed the untold riches which paved the kitchen floor in the people house at the end of their garden. Dog biscuits, bread crumbs, the odd squashed grape: no ant need go hungry, the envoy gushed evangelically to his superiors. Next thing we know, we have many ant farms, all run democratically by the ants. They have no doors but ant doors, hidden from the human gaze; run by the ants for the ants, with generous donations from the Shrewsday humans. The tiny free spirits are raiding the cupboards, the floorboards; they form orderly queues to claim the plunder just waiting for collection. But they’re free spirits. We tried to borrow an ant’s time and it found our hospitality wanting. When he’d checked out the living conditions he moved swiftly on. It was the right time. Sometimes you can’t make them stay. It’s like friends, isn’t it? We work with them for ages and then it’s time for them to move, and it feels as though all the comfortable little rituals we share are about to disintegrate, and nothing will ever be the same again. Because they were part of the companionable fabric of our lives, we took them for granted: and now it is time for them to walk out of the open door. Change is in the air: and sometimes change is painful. Tonight I hitched a dog, slightly crazed with heat, to a lead and headed to the flat-top of the iron age fort a stone’s throw from our house, on the edge of a forest which has suddenly, with the sun, become impossibly beautiful. And thunder clouds were sitting there in the sky, for observation purposes only, I think. The air was warm and thick, and suddenly I saw one of the most breathlessly wild sights you can see in a comfortable South Eastern forest. Have you ever seen it? Two swifts, hunting. Only with us for our warm months, these birds never land if they can help it. They spent most of their lives on the wing, far above us, spots in the sky. But on rare warm evenings, when low-flying fat bugs hang in the air around our heads, they come down low to get them. And you see them up close. You can’t press pause. You can’t stop them, air-scimitars that they are, slicing the warm currents with exuberant accuracy, more at home there than anywhere else. They are in their element, these small aerodynamic miracles, and totally focused on their work. Standing watching them I knew this was time borrowed, a transient moment lent me from the wild: a creature so absorbed in living that we could only spectate and marvel. But you can’t make them stay. We all work on a system which involves borrowing other creature’s time. Sometimes it’s people, sometimes it is an envoy ant. And sometimes it is a hunting air-scimitar, carving the air like a master sculptor. Borrowed time is what makes our world go round. Posted in Shrewsday MansionsTagged ant farms, ants, family, humour humor, managing change, swiftsBookmark the permalink. Lovely thought, Jas 🙂 Quite cheers me up! The swifts are usually birds of the grasslands (one of my favourite habitats). I also love watching, amazed at their speed and antics and how they never crash. They are so breathtakingly beautiful, aren’t they, Sidey? 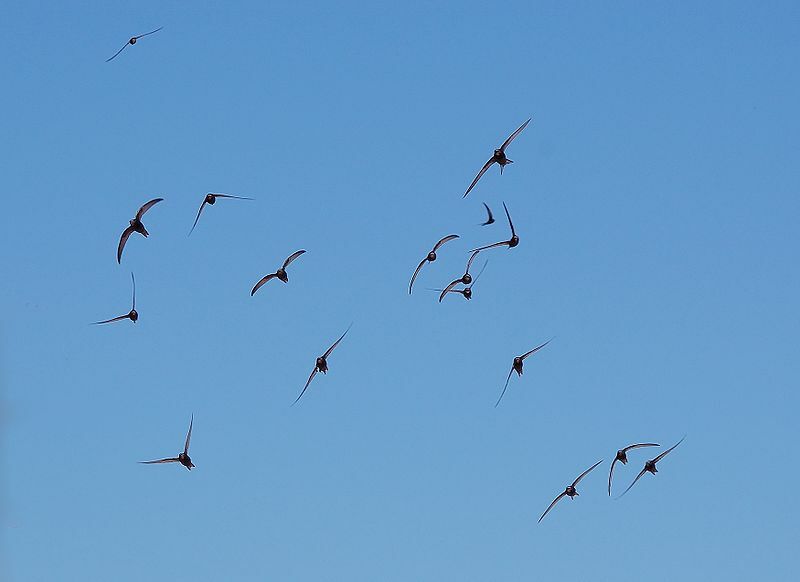 Beautifully written piece Kate – on a more mundane level – I am always amazed that Swifts mate on the wing, and I heard that Red ants have a sour farty smell when squashed – not something I have ever done but thought you might like to know! Rosemary, you are a mine of these interesting snippets. Sour farty smell, huh? The temptation to go and test it is only outweighed by the slight buddhist tendencies buried deep in my psyche. But should I be around when a red ant meets it end, and on the condition that no-one is around to deem me indelicate, I shall go and have a sniff and report back. I love the ant story, and the lead in to where friendships go! Beautiful post, Kate. Shame about the farm, though. Hope Felix can find some ants to call it home . . . for a time, anyway. Speaking of time . . . I’m in a London state of mind today. Last night, we watched Katie Couric’s interviews with Harry, William, Andrew, Beatrice, and Eugenie in honor of the Queen’s upcoming Jubilee! She’ll only be the 2nd queen to celebrate 60 years on the throne of England. Quite a milestone! No, you can’t stop time; you can only borrow moments. And you, Kate, have a gift for capturing them in words for the rest of us to enjoy. Just for Felix: have you asked for a visit to the Cotswold Wildlife Park, where they have a fantastic display of leaf cutter ants, working away? Oooh, half term project! Thank you, Pseu! Your post hit home today, the living on borrowed time with others part. My friend Alice (Cayleigh’s mom) is moving to Baton Rouge, Louisiana this summer. It’s a good move for her career-wise, but boy, will I miss her here. And, of course, I will be bereft without Cayleigh. Oh Andra, that is so hard. Change is so painful: losing those we have borrowed for a while for our lives’ fabric, that’s a lonely business. These days, there are small technological compensations in Facetime and the like; but a hug is just much further away. Heres to many lovely holidays together, and watching Cayleigh live a golden life. I love the scimitar allusion, Kate. We get swifts over her in summer, flying among the houses of our road. Ah yes, we are on borrowed time and the older I get the more I think someone else is borrowing much of mine. I did manage to lose a few pounds lately and hope I don’t find them. Oh, my, I’m in a silly mood this afternoon. Loved this post, Kate. “Change is in the air: and sometimes change is painful.” – so true, Kate. We change, friends change, and sometimes we go in completely different directions: the dynamics of life are a fact of life and we shouldn’t beat ourselves up about the plasticity of relationships. The way we were cannot always mirror the way we are. I have found this to be a painful reality in my 30s and 40s. That’s life. Oh, this tugs at the heartstrings. And if only ants could survive a translatlantic flight. I’d send him a whole colony’s worth.